Despite his illness, Becker continues to make music. By all accounts, Jason Becker was supposed to be a star — or, at least, a very famous guitar player. The Richmond native began playing at age five. By sixth grade he was covering Bob Dylan at his school talent show, and not long after he was mastering Eric Clapton guitar solos note for note. He spent his teenage years absorbing Bach fugues and writing his own compositions, incorporating complicated classical elements. While in high school he signed a recording contract with Shrapnel Records; he ultimately finished school early to tour with his heavy metal band, Cacophony, with fellow guitar player Marty Friedman, who later went on to play with Megadeth. In the mid 1980s, while still a teenager, Becker was playing on stages in front of big crowds, his face appearing in magazines. He seemed to be on a meteoric — and unstoppable — rise to fame. And it wasn’t just because he was a virtuoso guitarist. Becker, with his long rocker hair, was also a natural and magnetic performer who seemed to have an almost unreal control over his instrument. So when drummer Gregg Bissonette of the David Lee Roth Band called Shrapnel Records founder Mike Varney in search of a new guitarist, Varney recommended only Becker. At the time, the gig was one of the most highly coveted positions for a guitar player. Roth, of course, was most known for being the former frontman of Van Halen, one of the most successful and innovative hard-rock groups of its time, thanks largely to guitarist Eddie Van Halen. After Roth parted ways with the band, he formed his own solo group with another talented guitarist, Steve Vai. Becker would be replacing Vai, who was leaving to pursue his own solo career. After hearing his incredible playing over the phone, Roth invited Becker to audition for the band. He got the gig. For the young Becker — who wasn’t even 21 — it was a dream come true. Simultaneously, Becker had been experiencing weakness in his leg, and it began getting worse. Just a week after joining the David Lee Roth Band, Becker went to the hospital, where he received a stunning diagnosis: Amyotrophic lateral sclerosis, otherwise known as Lou Gehrig’s disease, a progressive neurodegenerative disease that leads to complete paralysis and, eventually, death. He was given three to five years to live. Becker managed to record one album, A Little Ain’t Enough, with Roth’s band, but his condition deteriorated rapidly. He was having trouble playing guitar. With no choice, Becker left the band and returned home to Richmond, fading from the spotlight. But that wasn’t the end of Becker’s story. In fact, contrary to his doctor’s prognosis, Becker is still very much alive, thanks to an attendant community of family members and caretakers. Although he is almost totally paralyzed except for his eyes and some other muscles, Becker is able to communicate using eye movements in a system his father devised. Through this letter-by-letter method, he has been able to write music. 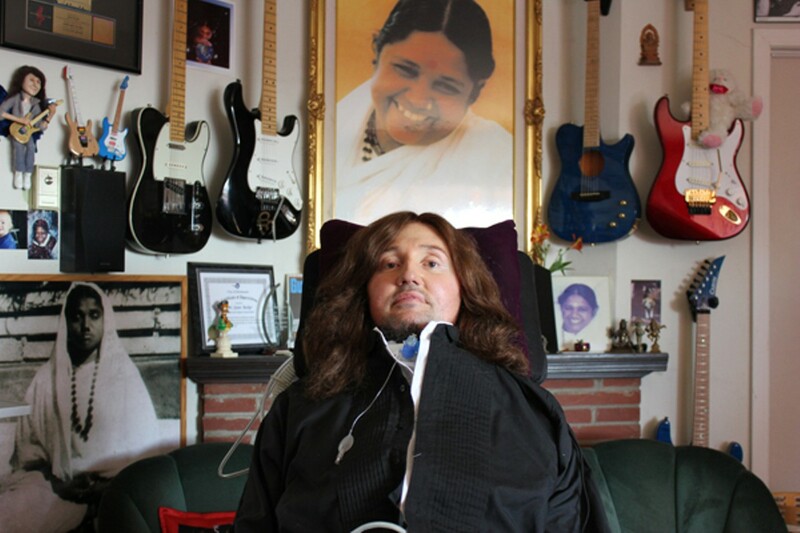 In fact, he has produced six albums since his diagnosis, and a recent award-winning documentary, Jason Becker: Not Dead Yet, has eloquently captured his inspiring story. A screening — which doubles as a fundraiser for the Jason Becker Special Needs Trust and the ALS Therapy Development Institute — will happen on Thursday, September 19, at Bimbo’s 365 Club. In a recent interview at his Richmond hills home, Becker said (with the help of his mother, Pat Becker) that he’s received many offers over the years to make movies about his life, and at one point there was even a Hollywood script in the works. But for various reasons, they either never materialized or he didn’t like the proposals. So when Vile initially approached Becker about the idea for his documentary, he politely declined. But Vile was persistent. At one point, he put together a trailer using footage he found on the Internet and sent it to Becker. “It was amazing,” said Becker, now 44.